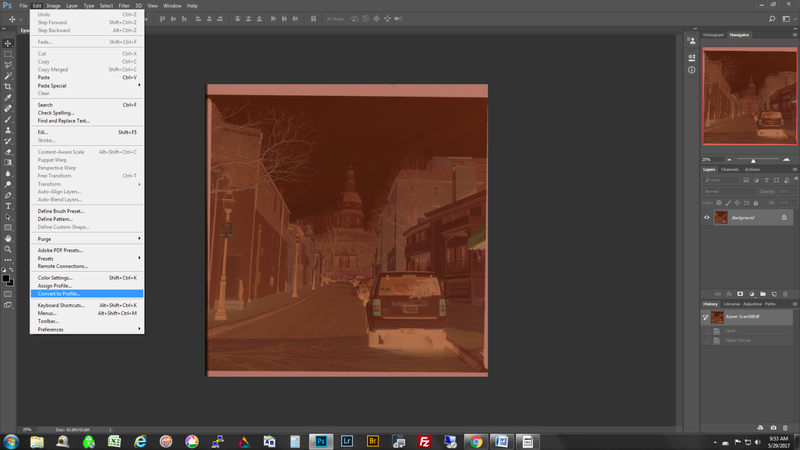 Here is a quick and easy visual tutorial for scanning color negatives using Epson scanners (v700 in this example) and ColorPerfect plugin. 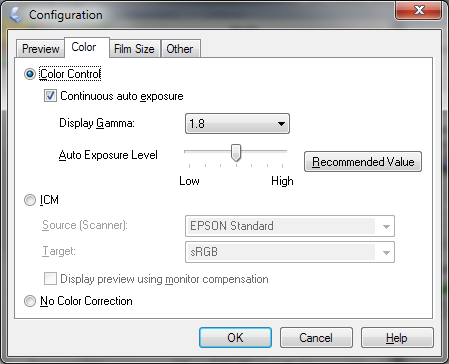 Select Configuration button at the bottom of the main screen in Epson Scan software and update the settings based on the following screenshots. Click OK when you are done with the all settings in the configuration window. 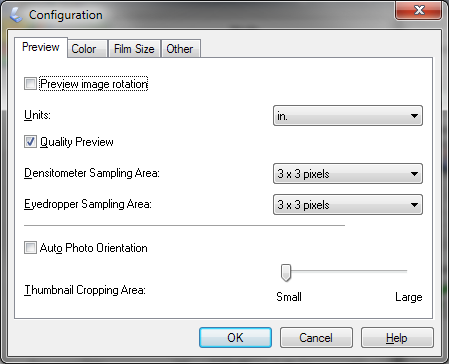 From the main window, select the File Save Settings (small icon to the right of the Scan button) and configure the settings to match the following screenshots. Please make sure that the Embed ICC Profile is selected. You are now ready to start scanning. Try to start with a DPI setting around 1200 – 1600. I have noticed that the contrast reduces with increase in DPI after approx. 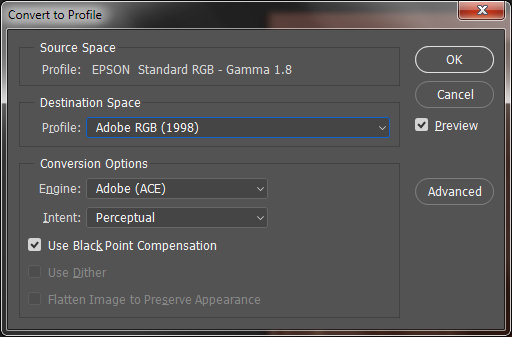 2000 DPI and it makes the inversion process more difficult. Always hit the Reset button after you have selected your scanning frame. 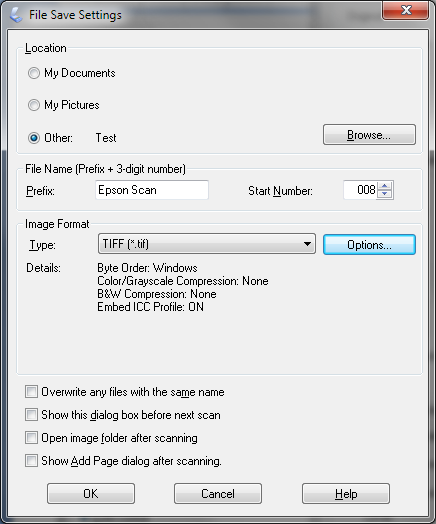 You do not want Epson Scan to apply any post processing other than scanning with the selected Gamma and Continuous Exposure setting from earlier. Make sure that all software processing settings (unsharp mask, grain reduction, and etc.) have been turned off. Use the following screenshots as a reference to make your scan. 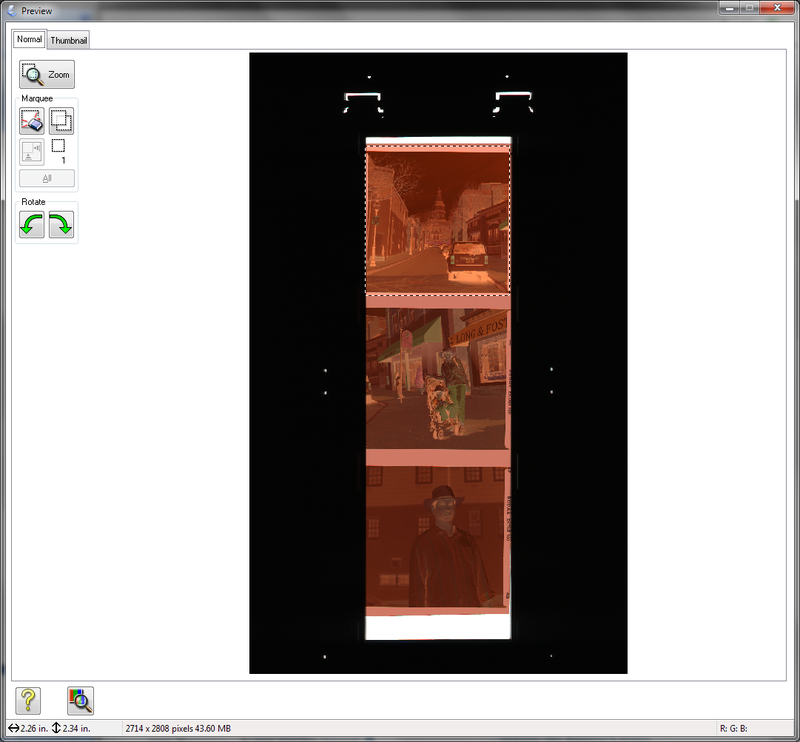 Notice the increase in brightness due to the automatic adjustments applied by the software when you selected the scanning frame. Click on Reset to remove all of these auto adjustments. See screenshots for before and after clicking on the Reset button below. The Reset button should be grayed out. Your preview should show normal exposure after the Reset button has been clicked. Again, see the screenshot below as reference. 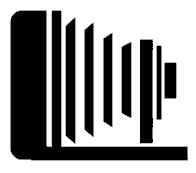 At this point, go ahead and click on Scan and save the Tiff file. Open your scan in Photoshop. 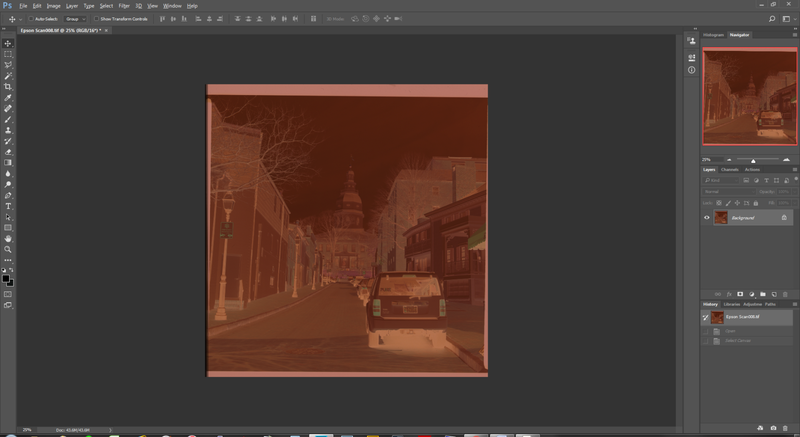 Let’s convert the scan to Adobe RGB profile which works best with the ColorPerfect plugin. From the Edit menu, select Convert to Profile and follow the screenshots as reference. 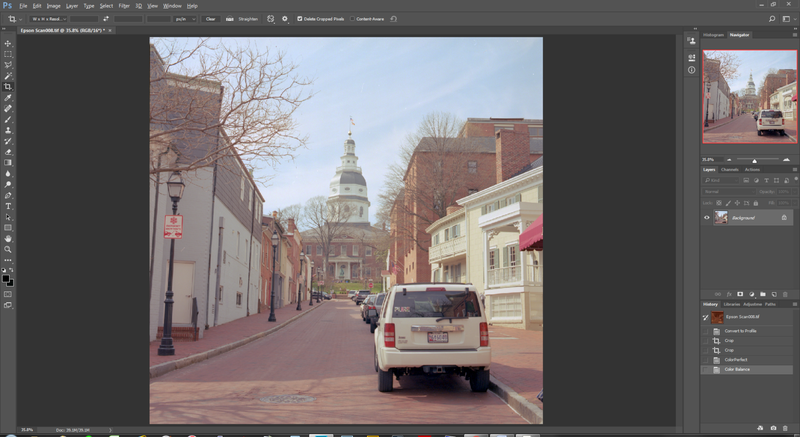 Once the file has been converted to Adobe RGB, remove any film rebate by cropping the image. 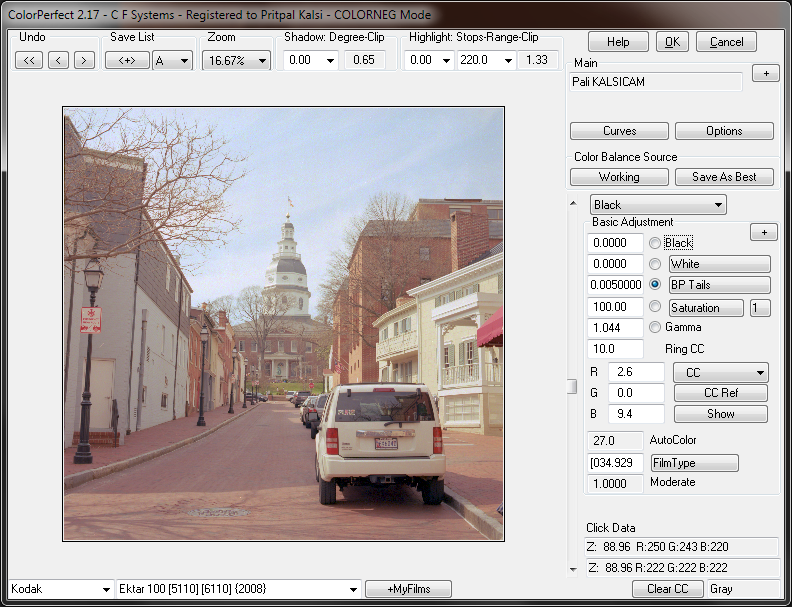 This helps ColorPerfect get the best conversion as a starting point. 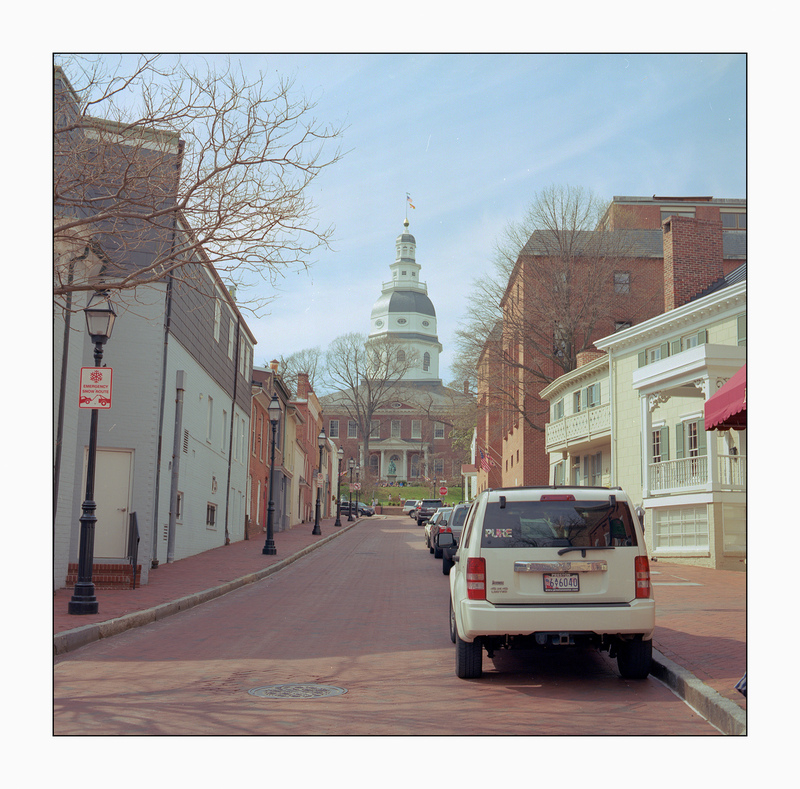 You can experiment with including the film border once you have mastered the basic workflow. Start ColorPerfect by selecting it from the Filter menu. 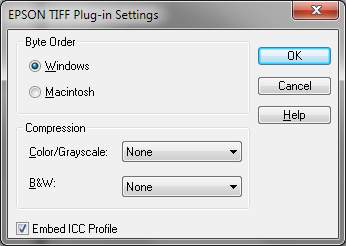 You will need to setup default settings for ColorPerfect the 1st time you use it. The settings to change are directly under the “Start” area on the top-right of the plugin. 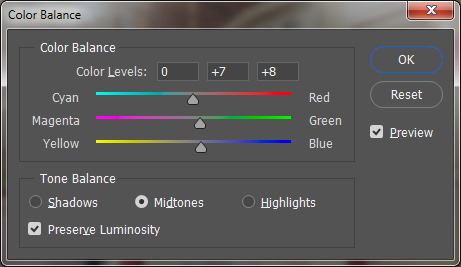 Make sure that these are set to ColorNeg and ‘L” for Linear and Adobe 1998 (profile we converted to earlier). If you do not see these options, click on [<<] icon on the top-left to bring back the default starting point. Also uncheck all options on the main layout with the exception of BP Trails. Set BP Trails to .005 as the default value. Once this has been setup, select the correct Film Brand (Kodak in this example) and Film Type (Ektar 100 in this example) from the drop-down selections at the bottom. You should see a very good inverted scan at this point with white balance still off. From this point on, it’s all a matter of personal preference. Here are few things that I typically go through to finalize my scan. Based on this scan, I can tell there is a slight cast to the image. Let’s use Photoshop’s one of the many magical algorithms to quickly eliminate it. Select CTRL + ALT +B -> Auto Color to remove cast. 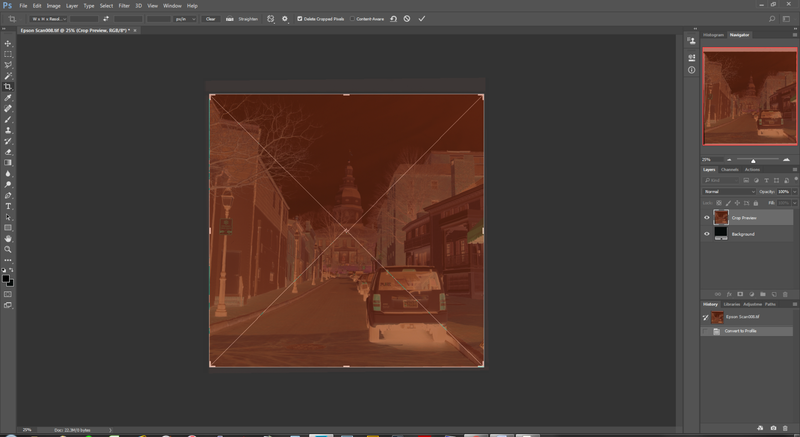 Here is what Photoshop selected in this case. Review and update if you like but I mostly just click OK at this point. Now lets apply a Contrast Curve (CTRL + M) to taste. 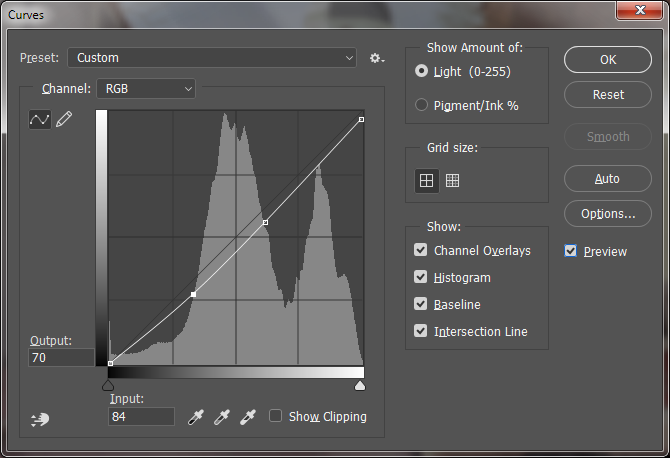 I try to select two points on the histogram. 1 for Shadows and 1 for Highlights. Here is the latest preview. I could just stop here but I want to show you a few other tricks that I use. One of the most powerful tools in Photoshop for photo editing is the Camera Raw Editor. Select it from the Filter menu or use the CTRL + SHIFT + A shortcut. Purely based on taste, I adjusted the white balance to add some “coolness” to the scan by adjusting the Temperate and Tint sliders under the White Balance settings. 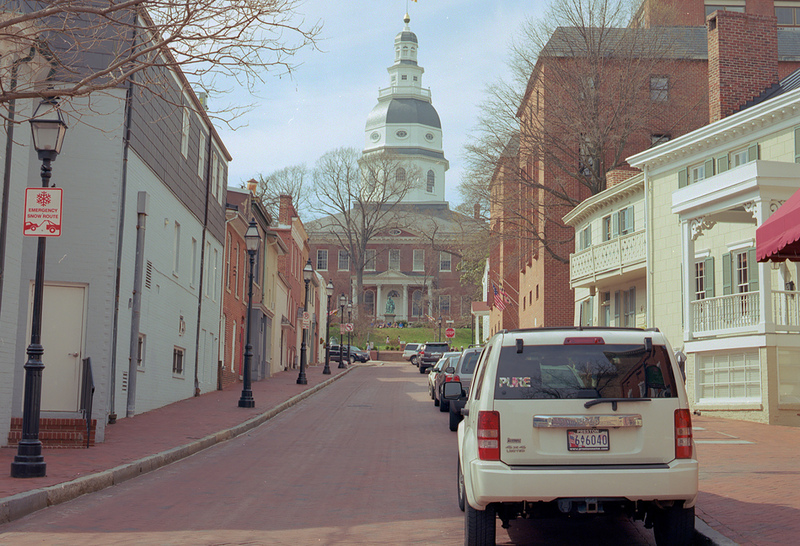 Keep in mind that Ektar 100 is a highly saturated film and it always scans that way when I use a drum scanner. 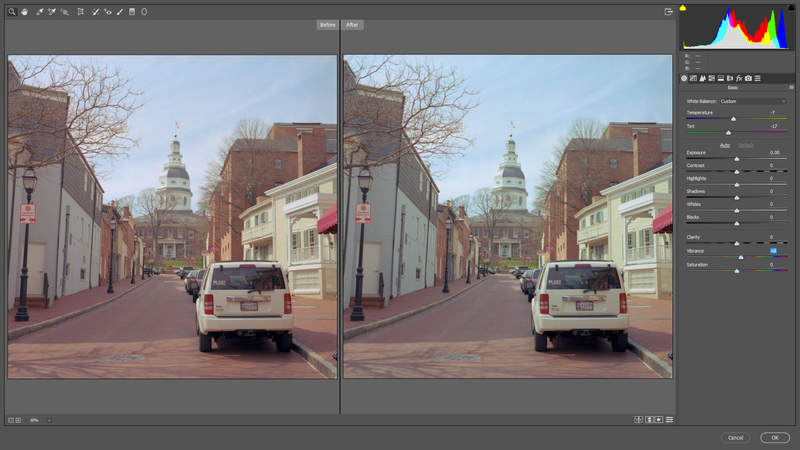 However, Epson scans tend to reduce the saturation which you can easily add back using the Vibrance slider. Click OK. Here is what our the scan looks like now. At this point, I am very happy with this scan. 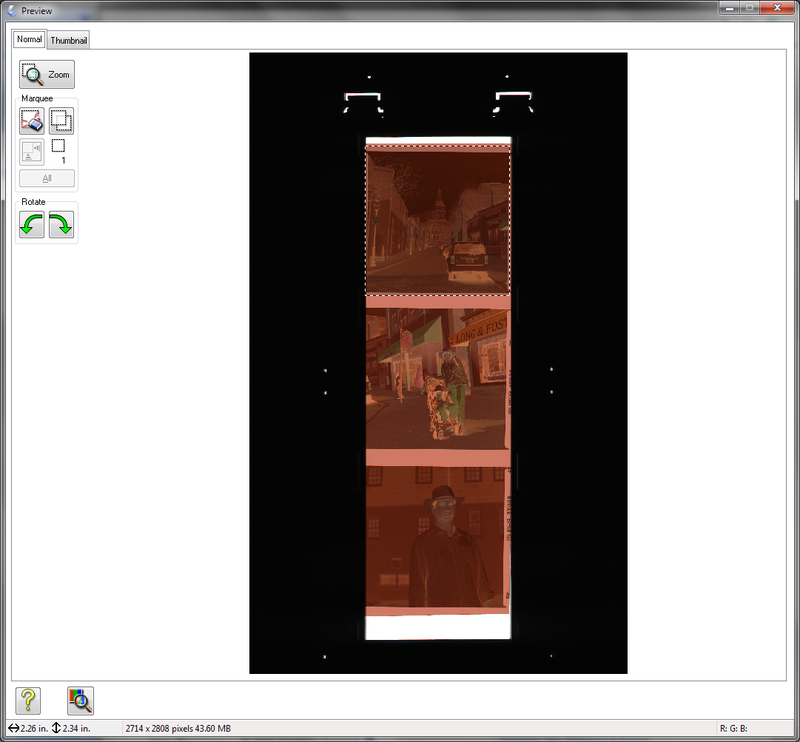 I typically add a white or black border to finalize the scan. Here is the final image!